This morning was our official press release announcing our new name and expansion of services. For our current subscribers we appreciate your business and for those just learning of our services, we trust you will join us soon. Currently there are approximately 200 hundred companies which have stock warrants trading either in the United States or in Canada. The opportunities with warrants are spread among many different investment sectors from banking, mining companies (gold and silver), automotive, oil and gas, pipelines, biotech and many more. Our mission at Common Stock Warrants (CSW) is to provide our subscribers with the tools necessary for you to decide, which if any, warrants appear interesting. We have used this expression for years, “You Pick The Company, We’ve Done The Math”. Investing in any of the stock markets in the world starts with investors deciding which companies in which to invest. Every investor has different areas of interest and each individual must perform their own research. Some investors will focus on earnings, others on cash flow and others on book value. At CSW, we provide you with the tools to perform this research, but the decision as to which company to pursue an investment in; is yours alone, or with the assistance or consultation with your financial advisors. Of course, your final investment decisions will be based on companies, which you feel will be good or excellent investments, right? Congratulations, you have just made the most difficult decision, which company, thus we say, “You Pick The Company”. Now and only now, can you consider whether to purchase other investment vehicles, options, LEAPS, stock warrants, or convertible securities instead of the common shares. Most of these ideas can be eliminated because of limited liquidity, few choices or too short of time remaining before expiration, thus we arrive at stock warrants as our preferred choice, but we do provide for our subscribers links to the LEAPS available. Armed with your list of preferred companies you now need to know which of these companies, if any, have long term stock warrants trading. Frankly, not only do investors need a list of all stock warrants trading, investors also need all of the details and particulars of each of those stock warrants, including, expiration date, exercise price, access to stock and warrant symbols, current quotes, and the knowledge of whether the stock warrants are currently trading at fair value, or undervalued or overvalued. Much of this detail information is difficult, if not, next to impossible to find on some of the companies. The knowledge of whether any stock warrant is trading at a fair value, or undervalued or overvalued is of the utmost importance to us. Our leverage calculations provide us this information and are based on the theory of our peer, Sidney Fried, “The Speculative Merits of Common Stock Warrants”, of many decades ago. Nothing has changed nor needs to change in making a proper valuation of the potential upside leverage in any stock warrant. Therefore, the methodology we use has stood the test of time and has worked well for our subscribers and us. 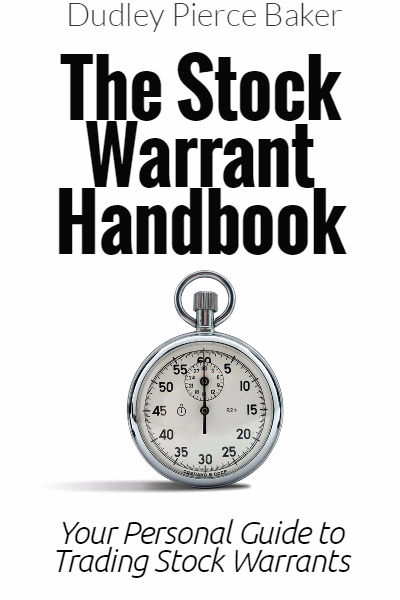 Subscribers have access to our detailed leverage calculations for each stock warrant trading. You will see the potential upside leverage as the common shares of the company you picked (above) gains, 50%, 100%, 200%, (out to 8 different price points) and how the stock warrants will perform, at a minimum. As a general rule, look for upside leverage of 2 to 1, meaning, if the common shares increase by 100%, the warrants should increase by 200%. This is our standard but sometimes the upside leverage can be substantially more. Thus, we would rate this warrant as undervalued and having ‘great leverage’. Those interested in stock warrants need the facts, details and leverage calculations in front of you ASAP and not spending your time trying to locate this information and frequently not succeeding. We place this valuable information at your fingertips allowing you to make a faster and more informed decision. Not a subscriber yet? We trust you will join us soon. Looking for our best deal? Take advantage of our Annual subscriptions and save 20% off of our monthly pricing.